Eat Breakfast and kick start your metabolism. 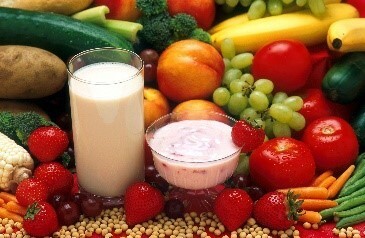 Include fruit and vegetables in your diet. Eat regularly and include fish, chicken and any lean meat in your diet. Drink plenty of water (6 to 8) glasses per day. Avoid late night eating and too many take aways! Be mindful of alcohol consumption. Some key foods to include are minerals such as magnesium, found in nuts, whole grains and green leafy vegetables, zinc, found in meat, milk, legumes and whole grains and iron, found in red meat, green leafy vegetables, eggs and some fruit. Omega 3 polyunsaturated fatty acids found in oily fish and some plants are also very important and of course vitamins such as vitamin B, C and E. Again whole grains, fruit and vegetables important here. Changes in our diet can enhance our cognitive abilities and indeed protect the brain from any damage, boosting our mood and general sense of wellbeing. So consider the benefits of certain foods in the wider context and you are not only trying to counteract heart disease and cancer through these choices but you are also protecting the brain and looking after your mental health. Go further and make exercise part of the equation and you are well on your way to a healthier you; another layer of self- care is sleep. Strive for 8 hours and when awake strive for healthy eating and moderate exercise. Our physical and mental state is often vulnerable and under duress so it is important to acknowledge this and fuel our being with the right nutrients and minerals when, and if, necessary. Needless to say have the occasional treat and indulge a little every now and then because something sweet and tasty is deserved and worthwhile after all your hard work to be good! Bon Appetite!